Let's get in the water! Photo by Kim Bracken. Most people who SCUBA dive have experience in the ocean. 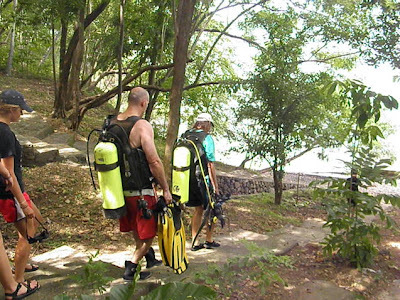 But diving in a tropical lake is a unique experience, especially when diving in Lake Apoyo. Its water is too salty to be potable, however it is still near the buoyancy of freshwater. Lakes differ from the ocean, too, in smaller waves and currents, and fewer dangerous animals. 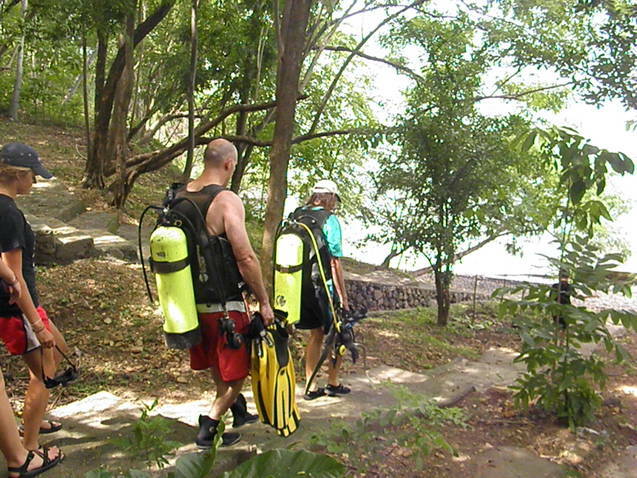 Lake Apoyo has essentially no moving water, making the dives easily managed. No fish or other animals in Lake Apoyo sting or bite! Lake Apoyo is not just a freshwater lake, however. 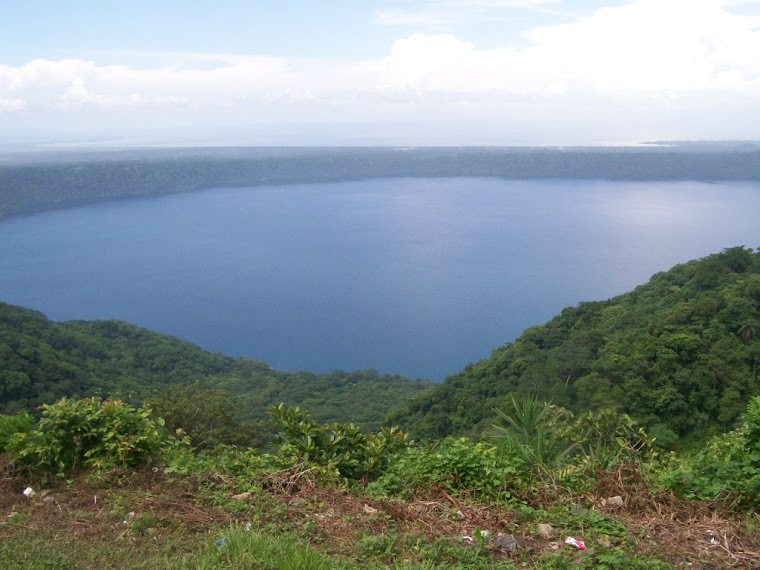 It is a volcanic crater lake, occupying a huge volcanic caldera between Volcano Masaya to the north and Volcano Mombacho to the south along the string of volcanoes across the Pacific side of Nicaragua. Because the Apoyo volcano is mostly a hole, however, the lake is its most prominent feature. 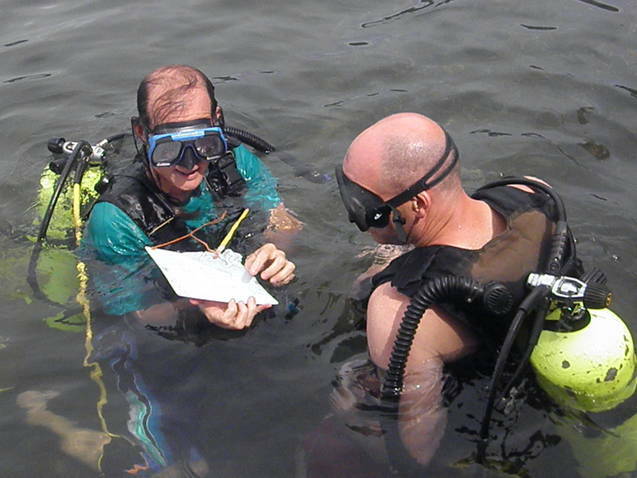 Divers discuss their dive plan before heading down. Photo by Kim Bracken. FUNDECI/GAIA coordinates SCUBA dives in Lake Apoyo, where you can accompany scientists in their study of the fishes. Each month, our divers review fish populations in several habitats, and visiting divers can join us on our dives. Divers get to see many species of fish in a single dive, and learn how these fish live, breed, and how we are working to protect them. 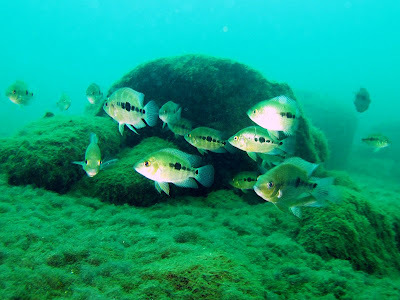 Not so many fish species occupy Lake Apoyo: only jaguar cichlids (Parachromis managuensis), mollies (Poecilia sphenops), silversides (Atherinella sardina), and several members of the Midas cichlid species complex (Amphilophus cf. citrinellus) are considered native. These fish populations probably got their start in Lake Apoyo by hurricanes, birds, or even the precolombian human populations that could have brought some individuals from Lake Nicaragua, just four kilometers to the east. Several endemic fish species from the Amphilophus species flock occupy Lake Apoyo. The research group at GAIA has discovered five species to date. Photo by Balasz Lerner. The Midas cichlid population of Lake Apoyo has attracted the attention of scientists for many years, and has been the principal cause behind the studies we pursue. In 1976, George Barlow began the current trajectory of interest in Lake Apoyo by declaring the arrow cichlid (Amphilophus zaliosus), as a new species. This lake is among the best study sites in the world for sympatric speciation among animals. Our group at Estación Biológica has studied these fascinating fish several years. In 2002, we published the official description of three new species in Lake Xiloa. Then in 2008, we published another set of species descriptions, giving official names to three species in Lake Apoyo. In 2010, we then followed with two more species descriptions in Lake Apoyo among the Midas cichlid species group. Our ecological studies in two lakes, Apoyo and Xiloa, where we have also performed several years of monitoring, are essential to the Midas cichlid species discoveries. Without being in the water, observing the fish month after month, we would never have been able to distinguish these very similar and closely related species. Our monitoring program has given us a wealth of information which is behind the species discoveries and several other new findings. These six species are elegantly displayed on our new Laguna de Apoyo t-shirts-please purchase one and support nature research in Laguna de Apoyo! Among the more common fish in Lake Apoyo today is the Bigmouth Sleeper (Gobiomorus dormitor). This fish was introduced to Lake Apoyo in 1991, and its population has grown dramatically. We at GAIA are studying the impacts of this introduced fish on the native species of Lake Apoyo. Photo by Wito Lapinski. The fish of Lake Apoyo are not just some rare novelties. They are facing some serious threats to their continued existence. One of the threats comes from introduced, invasive fish species. On a few occasions, tilapias have been introduced, most notably, in the 1990's as part of an aquaculture experiment using the Nile tilapia (Oreochromis niloticus). This misguided, disastrous activity was conducted with the approval and participation of the Ministry of Natural Resources and the Environment during that period. At the time, tilapia was touted by some influential individuals in Nicaragua as an economic "silver bullet" which would make investors rich and would feed poor people, as a kind of pinnacle to the Blue Revolution. The issue of environmental and health impacts of improper tilapia aquaculture methods in Nicaragua was recently featured in the New York Times. Many ripostes followed, too! In 1991, an over-enthusiastic local fisherman added to the mix in Lake Apoyo, by bringing a bucketful of bigmouth sleepers (Gobiomorus dormitor) he had just caught from another, nearby lake, to Lake Apoyo and dumping them in. A few fish quickly became thousands and today this fish is ubiquitous. The threats this fish poses to Lake Apoyo's endemic species is magnified by their loss of sensitivity to the dramatic threat the bigmouth sleepers pose to their fry. The research team at GAIA worked with scientists from Finland and Germany to demonstrate the evolutionary naivete to fry predation by the introduced bigmouth sleepers in a 2012 publication. 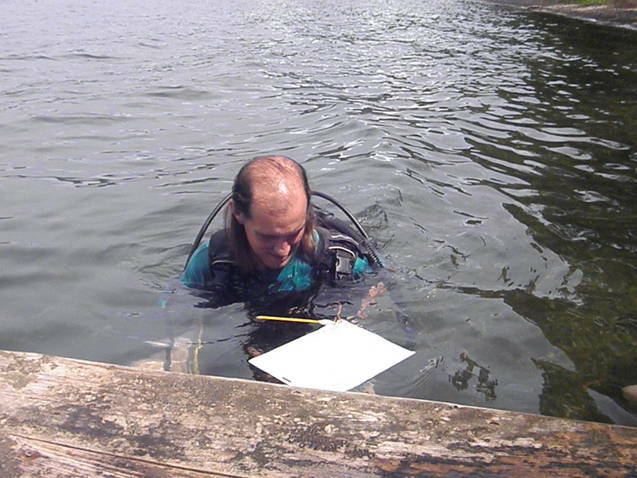 We also coordinate underwater lake cleanups periodically, our third one was performed in 2011. After collecting data, a relaxing moment by the pier is in order! Photo by Kim Bracken. Would you like to dive with us in Lake Apoyo? We would be happy to schedule a dive with you. You must have the equivalent of an open water certification. We can provide all the equipment and you can help us in our research on these very special fish. The Sea Hag loves this post! Must be cold in Finland.